Marquez possible ring return in Sep. or Oct.
By Dan Ambrose: Long time inactive former 4 division world champion Juan Manuel Marquez will not be fighting on August 19 as previously planned, according to promoter Fernando Belran of Zanfer Promotions. The 44-year-old Marquez (56-7-1, 40 KOs) instead will be looking to fight in September or October. The August 19 fight date wouldn’t leave enough time to promote Marquez’s fight. There still isn’t an opponent picked out, which obviously isn’t a good thing given that August is just one month away. “It could be until September or early October,” said Beltran to ESPN Deportes about Marquez’s comeback. The location for Marquez’s fight could be in Mexico City or Cancun. It’s been 3 years since Marquez last fought in beating Mike Alvarado by a 12-round decision in May 2014. Marquez was knocked down in the fight, and he’s had knee problems ever since. There was recent news that Marquez was interested in fighting WBO welterweight champion Jeff Horn for December or Miguel Cotto. If either of those fights is going to take place, it’s likely that they’ll need to wait until 2018. The boxing fans would obviously be interested in seeing Marquez face Horn or Cotto, but it’s not realistic for him to fight in September or October and then be back in the ring in December against one of those guys. Marquez could probably do it if he destroys his next opponent quickly without suffering an injury. However, the scheduling off an important fight in December wouldn’t make sense with the injury risk being present with Marquez fighting just 2-3 months before the important fight. Marquez would be dealing with a huge size disadvantage if he would go into a fight against Horn, who stands 5’9” and is quite heavy for a fighter in the welterweight division. Horn, 29, is somehow able to make the 147-lb. weight limit for the welterweight division, but he clearly looks like a junior middleweight at the very least right now after he rehydrates. The weight is basically what is giving Horn such an advantage in his fights. It’s not his technique. We saw what Horn’s technique consisted of in his recent win over Manny Pacquiao on July 2 in Brisbane, Australia. Horn lowered his head and charged Pacquiao all night long in ramming him. It was like watching a big running back running over a small defensive back in football. Marquez, 5’7”, would have to deal with the same things that Pacquiao dealt with in his 12 round unanimous decision loss to Horn if he were to take the fight with the Australian. Of course, if Marquez doesn’t care about being at a huge disadvantage in size and fighting in Horn’s home country of Australia, then it doesn’t matter if the cards are stacked against the popular Mexican fighter. The money would likely be too good for Marquez to turn down if he could get a fight against Horn. Marquez would be doing Horn a big favor by fighting him, as Top Rank promoter Bob Arum is talking about wanting to possibly match Terence Crawford against Horn. That’s not a good fight for Horn, given that he wouldn’t be able to use his size advantage Crawford like he could against the smallish Marquez and he would probably get out-boxed over 12 rounds. Marquez should try and setup an important fight by taking two or three tune-up fights first rather than quickly taking a fight against a popular guy like Horn or Cotto. If those fighters are willing to wait for Marquez to get a couple of tune-up fights out of the way for them to get a big fight against him, then it would be a smart thing for to go that route. Rushing into a fight with Horn or Cotto isn’t wise for Marquez. He’s been out of the ring for 3 years since his last fight in 2014. Marquez should do his best to show the boxing fans that he’s serious about wanting to be at his best when he comes back. If Marquez takes the fight against Horn or Cotto right away, it’s going to look to some in the boxing world like he’s just coming back for a quick payday fight before disappearing into retirement. Marquez might as well fight Pacquiao for a fifth time if there’s any money in that fight. I don’t know if there is. If Arum insists on sticking Pacquiao vs. Marquez 5 on ESPN, then it probably won’t be worth fighting the popular Filipino star again. Marquez can fight Horn on ESPN due to the big money he would likely be getting from the Australian side. Marquez-Horn is not a PPV worthy fight in the U.S. If the fight were on HBO PPV, it would likely bring in very low numbers unless Top Rank stacked the card with some of their best fighters in their stable like Terence Crawford, Vasyl Lomachenko, Oscar Valdez, Tim Bradley and Jessie Vargas. Marquez’s career was looking good following a 6th round knockout win over Manny Pacquiao in their fourth fight five years ago in 2012. Marquez has done little since that important win in losing to Tim Bradley by a 12-round split decision on October 12, 2013, and then beating Mike Alvarado on May 17, 2014. In hindsight, Marquez shouldn’t have taken the fight against Bradley, because it was obvious he was going to use nonstop movement for 12 rounds. Marquez should have insisted fighting someone popular that was more stationary. Facing Alvarado was not a good fight either, because he was not a popular guy and he had lost 2 out of his last 3 fights going into the match. Marquez should have insisted on facing a better opponent than Alvarado. The match-making for Marquez went downhill following his win over Pacquiao. As popular as Marquez was at the time, he deserved far better than to be fighting Bradley and Alvarado. It’s surprising how long it’s taken Marquez to find his way back to the ring to resume his boxing career. He’d been in negotiations for a fight against Cotto in the recent past, but the fight failed to take place. It would be a shame if this comeback for Marquez doesn’t take place in 2017. It would be a shame if Marquez is still talking about wanting to come back 5 years from now. It’s already been 3 years. 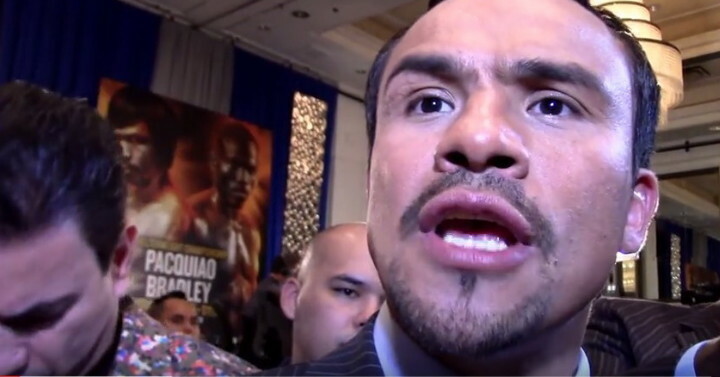 Boxing » Juan Manuel Marquez » Marquez possible ring return in Sep. or Oct.